Kat: On the weekend I visited Tongdosa Temple as another meetup with Ulsan photographers. I’ve been leaf chasing this season with the beautiful autumn colours (that’s fall, for you non-English speakers!). Temples offer a unique opportunity to photograph the seasonal changes next to oriental architecture. And it’s often difficult to get a clean landscape shot in Korea, because they’re often blocked by electrical wires, ugly apartment buildings and inconvenient town planning. 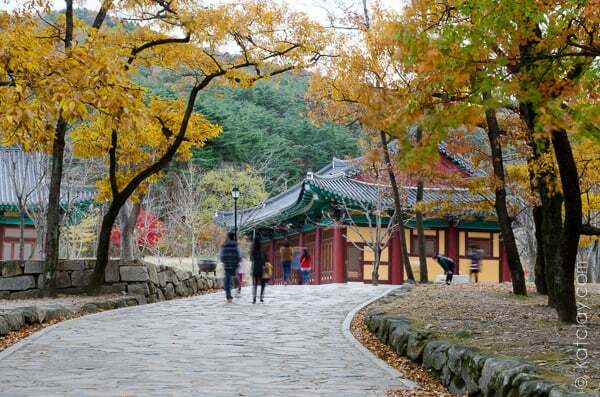 Tongdosa is the largest Buddhist temple in Korea, although it has no visible statues of Buddha. There is a long walk from the gate to the temple through a passage of trees. Unfortunately any picturesque shots of the trees was marred by the long orange safety tape on the right side of the path. Inside the temple complex I wandered along the river, looking for vantage points to see the changing leaves. Most of the foliage near the entrance was dead or dying. The light was not ideal for shooting, with an overcast sky not letting any sparks of light through. Despite these setbacks, I still discovered some beautiful spots for taking photos. It was a patient process waiting for fluoro clad ajumas to get out of my pictures, but I think I ended up with some good ones. 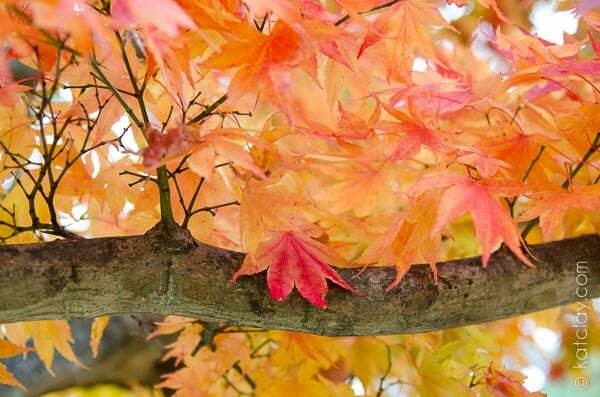 At this time of year, the trees are particularly beautiful while changing from green to red. The leaves take on a magical quality in the wind. I was attracted to leaves with multiple colours, blending in different gradients of orange and red. In an effort to escape the small crowds, I followed the river and crossed at one of the bridges, entranced by the promise of red leaves on the hill. I climbed up following a monk, looking for things to shoot in the forest. There were a great deal more red leaves on the hillside, and a good view through the trees. Unfortunately I couldn’t find an open panorama up the top, just a decaying persimmon tree. After a couple of hours I walked back in the dark to the bus stop, a world away from the tranquil temple, faced again with the neon lights of South Korean cities. Tongdosa is located between Busan and Eonyang, a suburb of Ulsan. There is a bus that runs directly from Busan’s Nopodong station to Tongdosa. From the bus terminal, walk up the main street to the left where the temple gate is visible. Entrance is about 3000 won.